I think Blogs are best when people are pissed off about something. One of the blogs I like to read is StupidMalaysia. He's pissed off about things here in Malaysia, just like I am pissed off about things in the USA. It's an ironic situation- I left the USA because I was tired of all the crap going on in my country. He left Malaysia and went to the USA because he was tired of all the crap that was happening in his country! It's nice to know that there are some people who actually give damn about what is happening in the world, and are willing to do something about it. Stupidmalaysia is definitely someone who cares. Writing about the injustices of this world, as he does about Malaysia, is a good start to making people aware, and getting things changed. Recently, he put a little posting in his Blog about the situation in Darfur. It wasn't a big post, just a picture and a link, and a couple sentences asking his readers to do something about what is happening there. 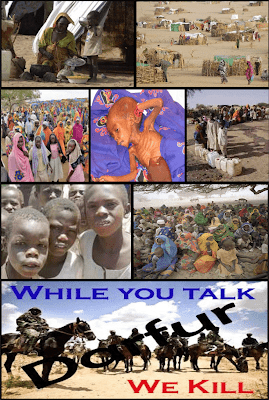 If you want to know what is happening in Darfur, Then you can learn more here. If you are too lazy to do that, then here is a Powerpoint presentation I downloaded from the site you can watch. So if you want to do something, instead of just being another do nothing apathetic workaday drone, then go to the "Save Darfur" website. There, you can send e-mail to George Bush, the Secretary General of the UN, and learn how to lobby members of Congress. You can find all sorts of different ways you can be someone, and make a stink about it! I did my small part. It only took a couple minutes. Now why don't you be a nice, caring human being, and do the same thing? So stop sitting there, and do it already! Add your voice, and make a difference!